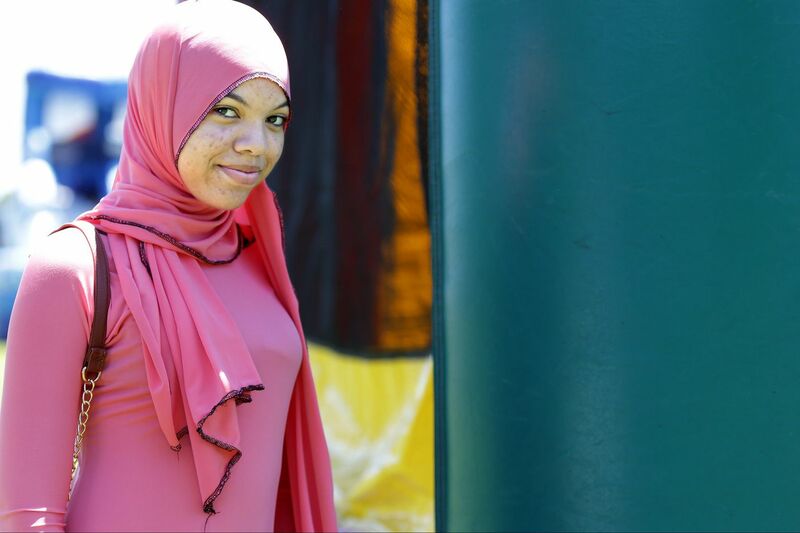 Angel Owens, 17, of North Philadelphia, attends the Eid festivities in Chalmers Park. Looking good for Eid isn't small stuff. It's prophetic tradition. The Hadiths — detailed collections of Muhammad's customs and directions — include recommendation that for the close of Ramadan, the monthlong holiday of strict fasting, one should bathe and adorn oneself with clothing. So after morning prayers resumed Saturday, festivals followed, and so did fashion. For the city's Muslim population of around 200,000, among the barbecues, face painting, games, and moon bounces, were outfits that have been planned with exquisite care. That meant traditional overgarments but with ruffles and bedazzling, or color-coordinated izars, the garments that wrap the waist. "Everything about it is intentional," said Kayla Wheeler, a visiting scholar at Boston University. Wheeler, who researches black Muslim fashion, compares Eid to Easter. "It's a place to show up and show out." But it's no catwalk, said Imam John Starling, executive director of the Gracious Center of Learning and Enrichment Activities in Cherry Hill. After all, the Quran advises: "Take your adornment at every masjid, and eat and drink, but be not excessive." The fashion, "within reason," Starling said, signals gratitude. Philly Muslims have a reputation for their "swag," said Wheeler, but that reflects a relationship between faith and self-expression, with room for many facets of ethnic, religious, and national identity. "You're supposed to wear your best outfit," Amanda Sloan, of Nicetown, explained while waiting for her body art to dry Wednesday at the Mount Airy studio of henna artist Hind Canty. "You're supposed to beautify yourself." Henna artist Hind Canty, 22, thinks that by Eid al-Fitr, a celebration at the end of Ramadan, she’ll have seen 100 clients in a week. In the middle of a 12-hour workday at a Mount Airy studio, she joked about the demand. “During Eid, I might wear a niqab,” she said, referencing a veil that covers her entire face, except the eyes, “because I don’t want anyone asking me to do their henna.” Muslim women get designs drawn on their hands in henna in preparation for Eid. Paris Sloan, 10, waits for her henna to dry. Canty’s ornate approach recalls traditional mehendi designs, but also lace embroidery and tattoo art. Canty, who went to Charter High School for Architecture and Design, said she looks at photos of African and South American architecture for inspiration. She uses Instagram, where her account @hennabyhind has 6,000 followers, to view henna art from the around the world. Mu’aawiyah Bowker, 3, of Northeast Philadelphia, also celebrated in Chalmers Park. His mother, Shawna Miller, selected this shirt because the beading and its color — the family wore matching shades for the holiday.